First, I had to decide what I wanted my class to achieve. I always do this when writing a new syllabus, and usually with a few levels. First, there's "What do I want them to learn even if they learn nothing else?" That's the most basic level, the level that I try to distinguish from passing or failing the class, the thing that should be so central to the core of the course that if you only attend 60% of the classes and do 60% of the work, you'll still get it. There are always other levels, but the first level is what provides the fuel for the first draft of the syllabus. The first thing I set out to do was choose the films I would screen in full during our weekly screening time. Class sessions are only 75 minutes long, so there isn't time to show most movies in full then, but there is also a 150-minute screening block on Monday nights. There was time to screen 14 films. I spent a week making lists. First, I made lists off the top of my head, figuring that the movies that came most immediately to mind were worth giving extra consideration to. Then I looked at all the DVDs and video tapes I own to see what I was forgetting, then reviewed my Netflix rental history (an amusing activity in and of itself, since there were plenty of films I'd forgotten I'd watched). After making my personal lists, I read every film syllabus I could find on the internet or from friends to see what sorts of movies people tended to show students. Finally, I went back to my three pages of lists and found six movies I considered the "core" of a list for class. These were six movies that met the most essential criterion: I would be happy to watch them multiple times, and felt I had something to say about them. Beyond that, they were the five films of the ones that met that criterion that also seemed to meet the curricular needs of the class. The core films were: Citizen Kane, The 400 Blows, Manhunter, Zodiac, Badlands, and Synecdoche, NY. There are obvious reasons Citizen Kane kept popping up on my lists -- it's a rare intro to film class that doesn't include it, and most intro to film textbooks feature considerable discussion of it. 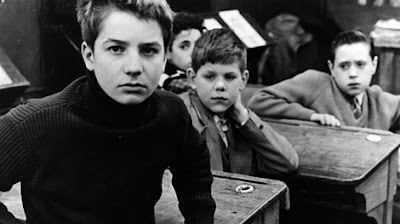 400 Blows is less common, but it kept coming back because it's one of two films I saw in college that completely blew me away (the other is Unfinished Piece for Player Piano), and I wanted to include a film that had been a revelation to me when I was an undergraduate. Manhunter is there not just because I love it (I do), but because Matt Zoller Seitz and Aaron Aradillas's video essay about it is brilliant and will be a great item for class discussion. Zodiac kept popping up on my lists because it's a great example of how digital cinematography can achieve different effects from film, and also because the narrative breaks so many expectations of what a "good" crime movie is. Badlands is there because it allows a nice comparison of all sorts of different things with Zodiac, and also because it will provide good fodder for conversations about voiceovers, music, and sound in general. Synecdoche almost didn't make it, because though it's a personal favorite I expect it's a movie that many of the students will hate. Then I decided this is a good thing. Or, rather, what I decided was a good thing is that Synecdoche is a movie that rarely produces bland feelings in viewers. Most of the people I know who've seen it responded strongly, some with passionate love, some with absolute hatred. I'm sure there are other films I've chosen that will have similar effects on the students, and probably a few of the students will have neutral feelings about Synecdoche, but this is the one that kept reminding me of my basic principal for the class: helping them define and articulate their responses to movies. Having a strong reaction to at least one film is vital to that quest. My first step toward a final list was to define more limitations. I needed to have some way to eliminate titles, because my basic limitation -- that I have to enjoy watching these films multiple times and be able to talk about them -- does not produce a small set of movies to choose from. I made the rather arbitrary decision to elimate comedies. This is not because I want my students to suffer and to realize the pain of living, but because if I were to use the genre of comedies in class, I would want to include at least five films, probably more -- I just couldn't figure out a way that I could teach comedic films without devoting at least half a term to comedy. (This may just be a holdover of my own experience -- one of the film classes I took at NYU was devoted to comedy.) I'll of course show some clips and maybe even short films of Keaton and Chaplin in class, but it was helpful to be able to cut out the comedies from my various lists (the ones that kept coming up were Duck Soup, The Lady Eve, and His Girl Friday -- yes, I am particularly enamored of a certain era and style of film comedies). Finally, I decided to try to find films that would work well together even beyond the basic groups I expected to put them into (films exemplifying certain essentials of form or narrative, films representing different approaches to culture or identity, etc.). Ideally, I thought, students should be able to keep comparing films all through the term, so that film number 2 was, yes, a good comparison with film number 3, but also with film number 10. By then, I had whittled my lists down to about 30 films. The trouble I had then was that the list already felt like it was leaving too much out -- it wasn't historically or geographically representative enough, it didn't include enough different types of films to show the full possibilities of cinema, and it gave too much weight to Hollywood. The only way I could get down to eight films to add to my list, though, was to ignore all of these worries. I needed to accept the fact that the films we screened in full would not be representative of anything except a group of movies I'm personally passionate about and that provide enough material for the students to write and think about. I would, I decided, point out all of the flaws of the group in class and encourage the students to research beyond what I had provided them. I would require them, too, to choose some films to view on their own -- some of the syllabi I looked at included assignments that asked students to write responses to films from specific eras or backgrounds, and since I planned to make short written responses a major assignment, I thought I'd do that, too: in addition to responses to the films we screen, I will ask them to write a certain number of responses to, for instance, a silent film of their choice, a film of their choice that's not in English, a documentary of their choice, etc. You'll notice there are 13 and not 14 films -- this was because when I plotted them onto the calendar, I saw that one of the screening times was on the first day of classes, and I wasn't sure if that would work. I decided to save it for an optional screening, though I had held off choosing what to put there. I watched each of the films on my preliminary list again and made one change. As important as Rashomon is, it's one of those classics that I can appreciate but not gain much pleasure from. I felt this way when I first saw it in college, but thought it might be because I was young and couldn't appreciate the movie's subtleties. And I probably couldn't appreciate its subtleties then, but even now, when I've read about and discussed Rashomon plenty with people who love it more than I do, it just doesn't do much for me. Oh well, I thought, I don't mind sitting through it, so I'll keep it on the list. But a week or two later, I decided against it, because I found myself looking forward to all the other screenings and dreading having to sit through Rashomon again or having to try to talk about it with any excitement. Obviously, it had to go. And be replaced with what? First, I thought maybe another Kurosawa film would do -- I could watch Seven Samurai once a week for the rest of my life and be perfectly happy, I think. Or, though I might not want to watch them every week of my life, I've had good luck using both Throne of Blood and Ran with classes in the past, and enjoy them immensely. And though I like Kurosawa less when he's not in his historical mode, I do enjoy High and Low and The Bad Sleep Well quite a bit. (I'm not a die-hard Kurosawa fan beyond the titles I've mentioned, though. I've seen nearly all of his films that are available in the U.S., and there's at least one scene in each that astounds me, but he's more a director I cherish for particular movies than for his body of work.) I use Seven Samurai with one of my other classes, though, so decided not to include it here, in case I have some students I've had in the past. High and Low in particular would have fit well with many of the other films on my list, but instead I decided to replace it with Cabaret, a film I adore and that will allow us to look at editing, mise-en-scene, narrative structure, cinematography, etc. We can talk about the staging of violence. We can talk about representations of history and sexuality. And it is one of those movies that, though I can go on and on about various intellectual topics it raises, I cherish ultimately because it is so completely engaging and pleasurable. I'm also going to show Ousmene Sembene's Black Girl, which is only 65 minutes long, during one of our regular classes. Though I've used it in another class, I'm making an exception to my rule of not using a film in multiple classes, because the length makes it easy to fit into a class period, it tends to provoke lots of good discussion among students, and it fills multiple gaps in the screening list. Finally, I settled on Sullivan's Travels, because though I had ruled out comedies, the perverse part of me liked starting with a comedy that advocates the value of comedies over serious dramas.